Have you ever wondered the significance of the parable of the lost coin. For a long while, I always wondered what was the big deal with the lost coin in Luke_15:8-9. Why did Jesus use a illustration of a lost coin, and why would a woman take the trouble to look for one lost coin, and after finding it, throw a party for the neighbours? "If anyone comes to me and does not hate his father and mother and wife and children and brothers and sisters...."
Comparing the two versions of Jesus' "Cost of Discipleship" teaching (Mt. 10:37-38; Lk. 14:26-33), one can see that, apparently, the author of Matthew decided that his readers would not understand the extremely Hebraic statement of his source (preserved in Luke), "If anyone comes to me and does not hate his father and mother and wife and children and brothers and sisters...." (Lk. 14:26). Knowing his Greek-speaking audience, Matthew assumed that these Greek speakers would not understand the word "hate" in Hebrew, "hate" also can mean "love less than," just as "love" can mean "love more than, prefer" therefore, he wrote, "The person who loves father or mother more than me is not worthy of me; and the one who loves son or daughter more than me is not worthy of me...." (Mt. 10:37). The Book of John which records most of Jesus' miracles, documents this miracle of Jesus turning water to wine as His very first miracle. 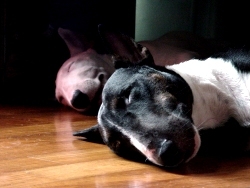 Hi, see my dogs, Ariel and Darius. They say "let sleeping dogs lie", but as for my dogs, lying is forbidden... else they will be in eternal darkness because they will not wake up for good.